First it was pink, then silver, and now it’s been refreshed once again with a nice coat of white. 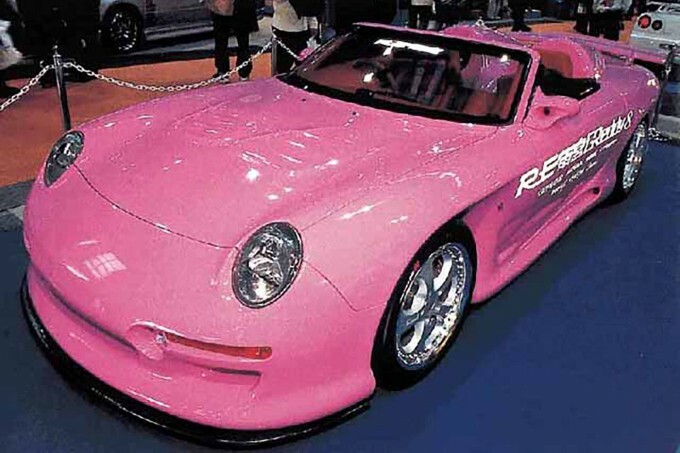 Back in 1999, this is the car that world-renowned Japanese rotary tuner RE Amemiya built as the center piece for its booth at the Tokyo Auto Salon. 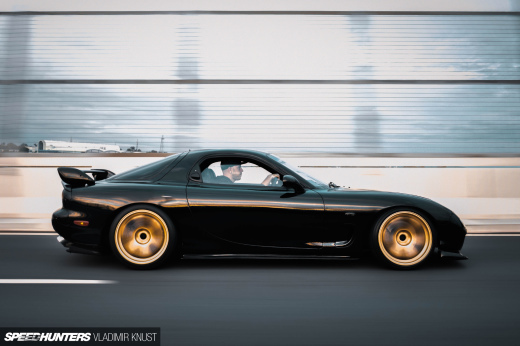 Over the last 16 years the FD3S Mazda RX-7 based machine has passed through a few hands, but it’s always made a regular appearance at 7’s Day. 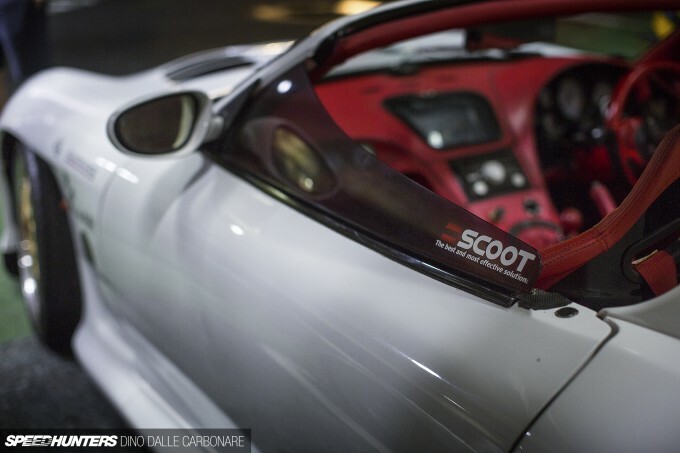 It’s always great to see iconic JDM cars being maintained and sometimes even evolved, and this particular creation is now being looked after by Koseki-san at Scoot. 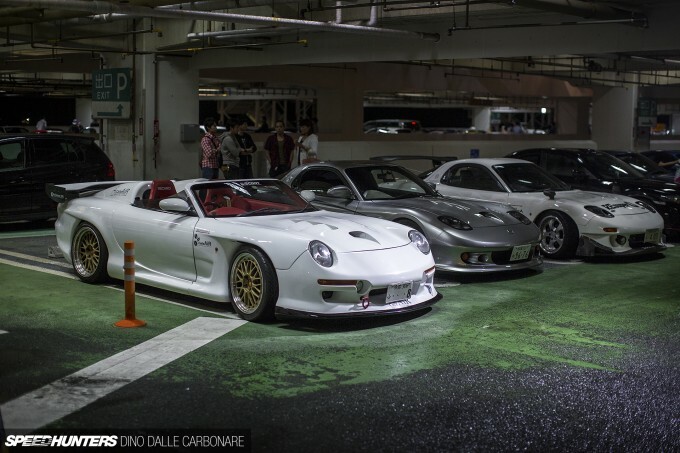 You can see Koseki’s 4-rotor FD3S RX-7 – a car I photographed way back in 2005 - parked right next to it. Here’s how the RE Amemiya Super GReddy 8 looked originally though. Talk about having visual impact! 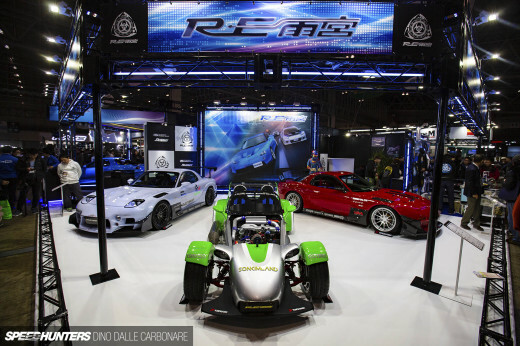 Since its debut at TAS more than a decade and a half ago the car has probably run a variety of different wheels, but the original RE Amemiya AW7s are long gone now. Today, it’s a set of BBS LMs under the smoothly-contoured fenders. If there’s one thing you can’t go wrong with, it’s BBS LMs! The 13B under the hood runs a Trust TD06-25G turbocharger along with all the supporting modifications required for 400 or so horsepower. I’m assuming that at the very least the original, archaic engine management system has been swapped out for something more modern, and that the twin rotor motor itself has been refreshed at some point. 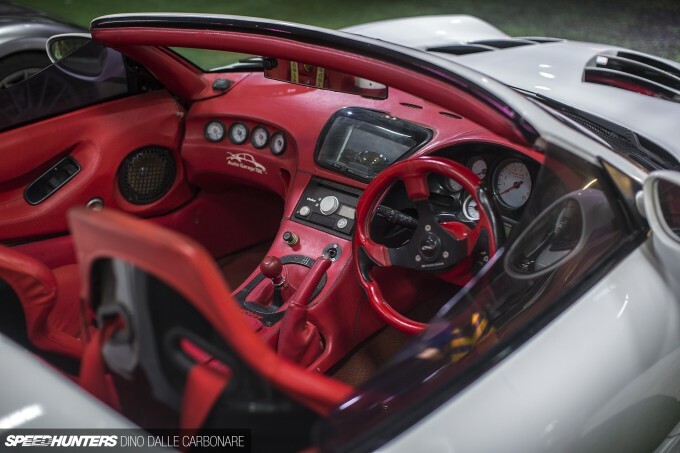 Amemiya-san really went crazy on this project back in the day, not only creating the wild exterior, but also a full custom interior built around a bespoke dashboard. GReddy gauges keep the passenger entertained, and if you look closely you can see how the entire dash is wrapped in custom-stitched leather. The clear covered storage box has obviously seen better days. 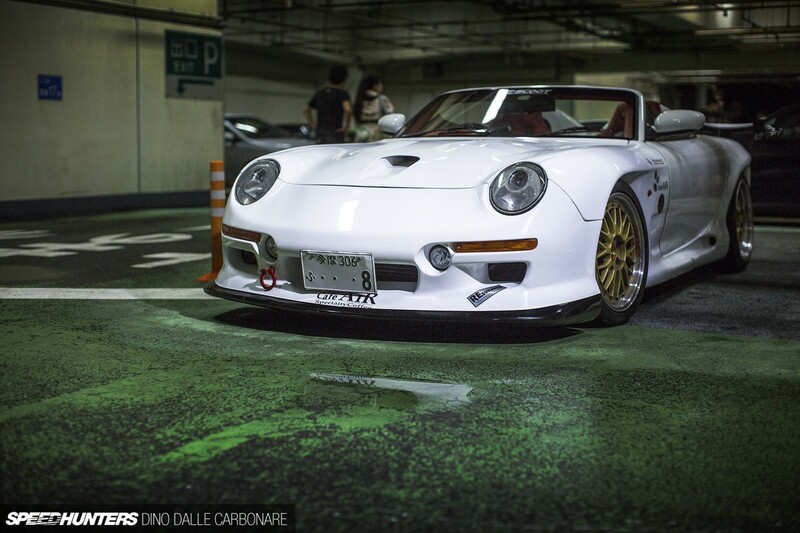 The AC987 exterior conversion – as Amemiya named it back in the day – doesn’t turn the FD into a convertible, but rather a speedster. 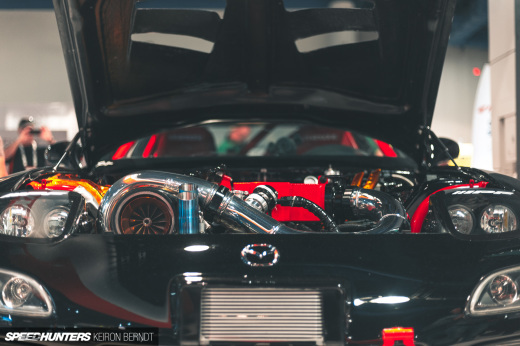 There is no roof – it’s strictly an open-top car – and those rear humps that cover the area where the rear seat and trunk were in the production RX-7 are actually massive subwoofer enclosures. Yup, this is show car through and through. 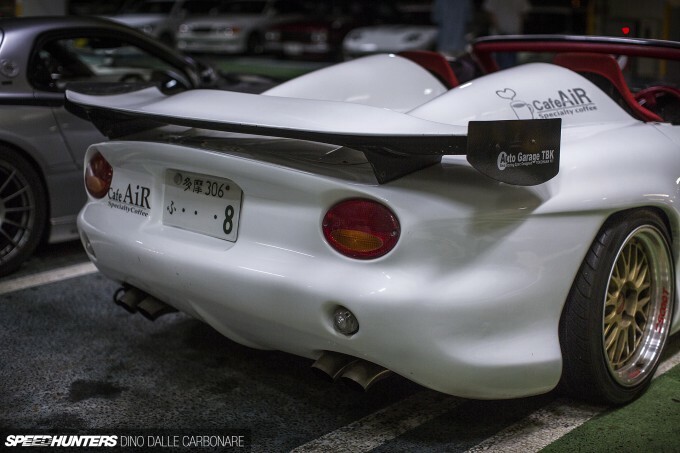 The AC987 rear end is a complete redesign of the RX-7’s backside, transforming a recognisable shape into something that looks far more exotic. I quite like this conversion and you actually still see FDs running it today in Japan. The low-mounted wing was what really made the rear of the GReddy 8 so recognisable. With all the Auto Garage TBK stickers around the bodywork, I’m assuming this is the place where the car was repainted. Not only does the Mazda lack a roof, but there’s no door glass either – just contoured pieces of Lexan on either side. That’s partly because the A-pillars were chopped in the speedster transformation and the factory windshield replaced with a custom cut screen. Bringing this car out in the middle of the rainy season for 7’s Day was definitely a bit of a gamble for its owner, but then again, if you drive fast enough you probably wouldn’t even get that wet! Jokes aside, it was very cool to see this blast from the JDM tuning world past show up at this year’s gathering. I wonder how much torsion that chassis can take now it has no roof. That cockpit looks like a very happy place to be. I could never finish a list of all the things I like about this car. It is mind boggling how creative and different everything about it is, yet how gorgeous it all comes together. Infinite style. Cheers for the post Dino. So this is the Super GReddy 8 as she sits now? Wow. While I can honestly say I miss the pink, white suits the car just as well and I've always been a sucker for the AC987. Just something about it looks right. I guess the best way to describe it is "refreshingly different" to your average FD. Wish it still ran the AW7s though. Love those wheels. Made by Desmond IIRC. 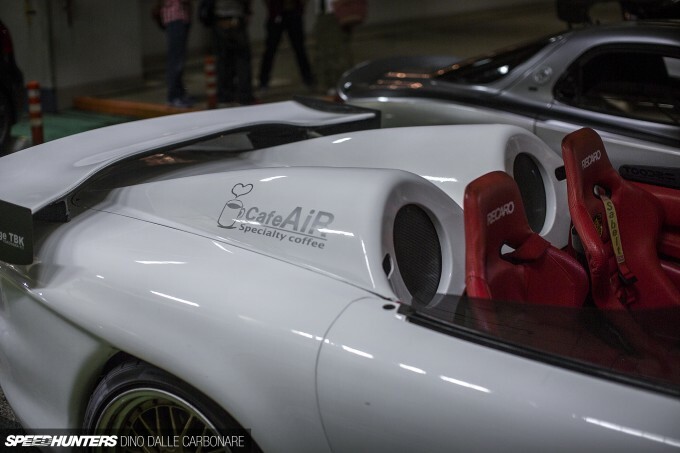 Is this the only open-top AC987 in the world? I remember this car back when I was just thinking of a learner license and at the time this was "FWWOOOOOR!!" Now 10 years (!) on in refreshingly nice white, this thing is oh so cool. Back end looks very British and front Porsche-ish ....all with a touch of Gemballa. The rear quarter shot has more than just a resemblance to the xk180. Love the 8 though, proper testament to see it's lasted so well. 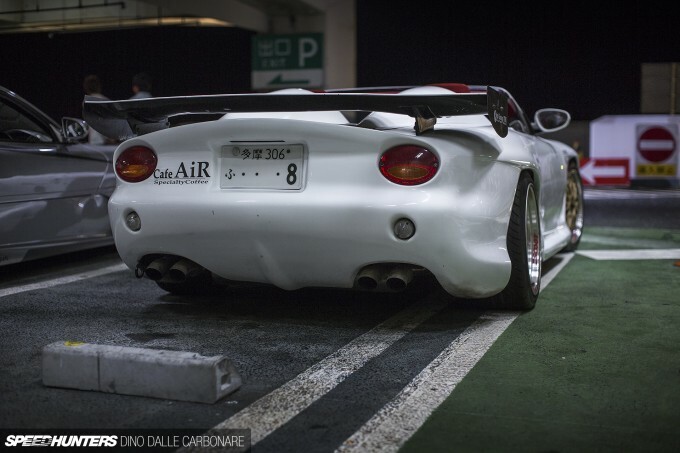 koko san i agree - I get a Noble M12/M15 vibe from the car in places alongside some TVR-ish moments too. TarmacTerrorist koko san TVR a lot. Damn this cars as old as me so I'd never seen it before this post Dino, and it's a very weird and wacky car!